Hi Sylvie, sweet card, love the stamp. Gorgeous card, love the image and all the embellishments are delish! This is so cute! 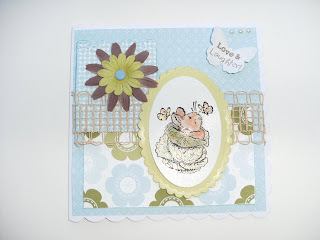 I love the cute rabbit in his little cabbage and the papers are fab! Thanks for playing along with my Penny Black sketch! This is so very cute. You've done a great job with all the details and colors! When I came to your blog, I was surprised to see that we have something besides Penny Black in common: I love same backgroundfairy flowers that you do.